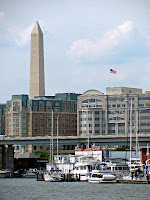 We are anchored a few blocks from the White House in the Washington DC channel. 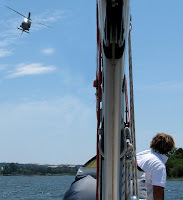 It is administered by the Washington Harbour Patrol with whom we checked in on VHF 17. 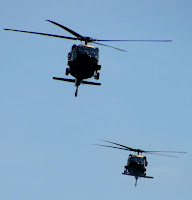 It’s an activity filled anchorage what with the planes flying into Ronald Regan National Airport on the other side of the river and helicopters passing overhead all day and night, shuttling Senators and Generals to and from the White House. The chopper pilots seem to play chicken with the masts. Certainly we feel the vibrations if not the downdraft. If there are three or more in formation it’s the President. Three? The eeny meeny, miney, mo theory of guess which one he is in. Their shifting formation is known as the Presidential shell game. On the evening of July 14th at 11. 55pm, just after we had watched the movie “In the Shadow of the Moon“, Ron Howards’ fascinating and moving documentary giving voice to the lunar astronauts, three helicopters flew over Seraphim. 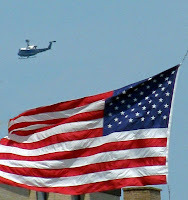 One peeled off over the White House, the 44th President of the United States, POTUS, was going home having thrown the ceremonial first pitch at the All Stars Baseball game in St Louis. 15th July 18.02pm Space Shuttle Endeavour finally launched after over a month of delayed flights. 16th July 2009 9.32am is the fortieth anniversary of the Apollo 11 launch. The mission during which Neil Armstrong and Buzz Aldrin were the first men to walk on the Moon. John hopes to meet Buzz at a Smithsonian book signing on the 19th. And talking of pilots here is a picture taken in November 08 when we flew home from Mallorca. I felt the Easyjet pilots were too young to tie their shoes laces let alone fly but we made it to Luton safely where our boys had a picture with the flyboys. Jack is holding a compass given as a leaving gift from a friend in Palma hoping to guide his return. Seeing the Ruby Slippers from the Wizard of Oz in the Smithsonian, I was reminded that if I tap the heels of my pink Jaime Mascaro stilettos they’ll take me back to Palma. Tomorrow we continue our sojourns around the six Smithonian museums and the Monuments of Washington DC. Get's the old heart-rate thumping when those things fly overhead. For more helicopter/boat action check out this article, where we witnessed forest fires threaten to engulf our boat yard in Turkey. All staff were on standby, as were the huge great big hoses.